In ACE, a workflow is a flowchart of modules which work on samples. The end result is not necessary the sample age, it could be calibrated HLSL production rates, scaling factors, etc etc. However we expect that new workflow creation will be of interest only to a few people, and these few people will most likely have different requirements from each other. For this reason we have not made the workflow editor user friendly. A future version of ACE will have a graphical user interface for the workflow editor, but even this will not be of much help to non-developers. 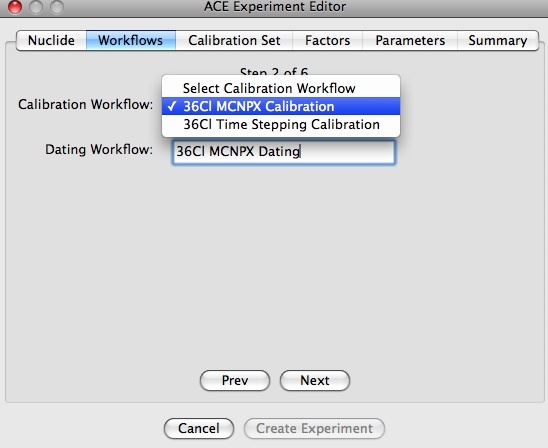 This workflow lists its function (dating), the nuclides it can operate on (3He, 26Al, 21Ne, 14C, 10Be), and this gives a text version of the workflow components, all of which are stored in the Components directory of ACE. For example this workflow starts with the module InitInventories.py and then passes all the sample data to StepForInventories.py. At this point it enters the timestep loop (StepForInventories.py.loop) and exits when the samples are dated. So if the user selects ‘Fairbanks 1989 + Shackleton 2000′ to model sea level changes for a sample, the module InstSeaLevel.py is used at the Factor<sealevel> location in the workflow. To develop this routine we started with the original workflow, duplicated and renamed it, modified some modules and listed them within the workflow. In this way, differences between workflows can be easily assessed by contrasting the workflow outputs against each other.